An election campaign adviser to Donald Trump has pleaded guilty to lying to the FBI about the timing of meetings with alleged go-betweens for Russia. George Papadopoulos admitted the talks happened while he worked for Mr Trump, not before, court papers show. He said he had been told the Russians possessed "dirt" on Hillary Clinton. Separately, former Trump campaign manager Paul Manafort pleaded not guilty to charges of money laundering unrelated to the 2016 election. The charges against Mr Papadopoulos are the first to be brought by Robert Mueller, the special counsel investigating alleged links between Russia and the Trump campaign. Who's who in the Russian drama? It has the potential to damage the US leader because it relates directly to his campaign, analysts say. Mr Papadopoulos - a Chicago-based international energy lawyer - was close enough to then-candidate Trump to be part of a photograph (third from left) of his national security team which Mr Trump tweeted on 1 April 2016. According to the court documents, Mr Trump's former foreign policy adviser admitted on 5 October 2017 to having impeded the FBI's investigation into alleged collusion with Russia. When he was interviewed by the FBI this January, he falsely claimed that he had met two figures with Russian connections before joining the Trump campaign in March 2016. In fact, he met them after joining the campaign. One was an unnamed Russian woman who, Mr Papadopoulos believed, had connections to Russian government officials. He admitted seeking to use her connections in an effort to arrange a meeting "between the campaign and Russian government officials". The other person was an unnamed, London-based professor who was said to have "substantial connections to Russian government officials". The professor only took an interest in Mr Papadopoulos because of his status within the Trump campaign, the statement says. Russian "dirt" on Mrs Clinton, in the form of "thousands of emails", was allegedly mentioned by the professor at a breakfast meeting in a London hotel on or around 26 April 2016. Robert Mueller, in journalism terms, buried the story. Initial headlines on Monday morning were about Paul Manafort's indictment for money laundering and undisclosed foreign lobbying activities. The real blockbuster, however, may end up being George Papadopoulos's plea bargain, which was disclosed shortly after the Manafort news came out. 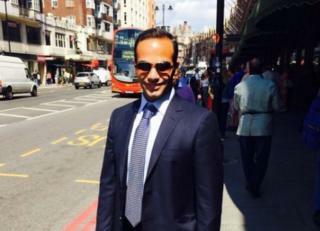 Unlike Mr Manafort, pinched for activities largely conducted before he joined the Trump team, Mr Papadopoulos has admitted to lying to the FBI about contacts he had with Russian nationals while serving as a Trump foreign policy adviser. Mr Papadopoulos's indictment document reveals he learned from his connections that Russia claimed to have "dirt" on Democratic candidate Hillary Clinton in the form of "thousands of emails" in a late April 2016 meeting. Damaging emails from the Democratic National Committee and Clinton campaign chair John Podesta started emerging, through Wikileaks, just a few months later. Now Mr Papadopoulos is co-operating with the independent counsel's office. At the very least, he has told them who in the top levels of the Trump campaign he was passing this information to. If Mr Mueller's case ends up about more than just illegal activities by Mr Manafort and a business associate years ago, Mr Papadopoulos could be a key piece of the puzzle. What are the charges against Manafort? Mr Manafort and one of his business associates, Rick Gates, appeared in a Washington court on Monday to deny 12 charges, including conspiracy to launder money. The former campaign manager was placed under house arrest and ordered to post a $10m (£8m) bond while Mr Gates was also placed under house arrest and ordered to post a bond of $5m. The indictment against the two men, which accuses them of "conspiracy against the United States", looks at their links to pro-Russian politicians in Ukraine between 2006 and 2015. What is 'conspiracy against the United States'? 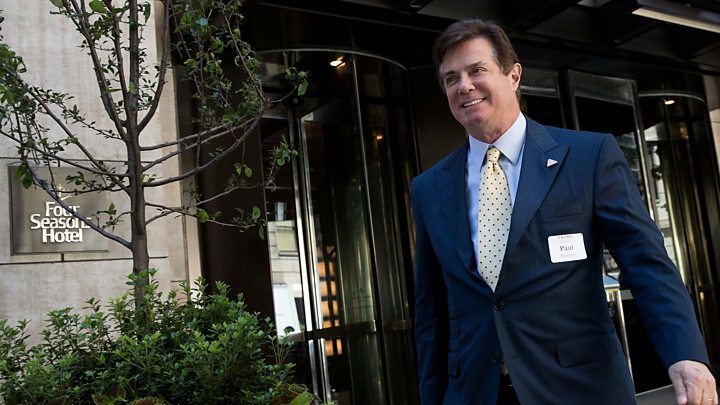 Mr Manafort is accused of having laundered more than $18m through offshore bank accounts, using it to buy property, goods and services in transactions concealed from the US authorities. Speaking outside the court, Mr Manafort's lawyer, Kevin Downing, said his client was innocent. "Maintaining offshore accounts to bring all your funds into the United States as a scheme to conceal from the United States government is ridiculous," he added. How did the White House react to Monday's developments? White House spokeswoman Sarah Sanders said the role of Mr Papadopoulos in the Trump campaign had been "extremely limited". 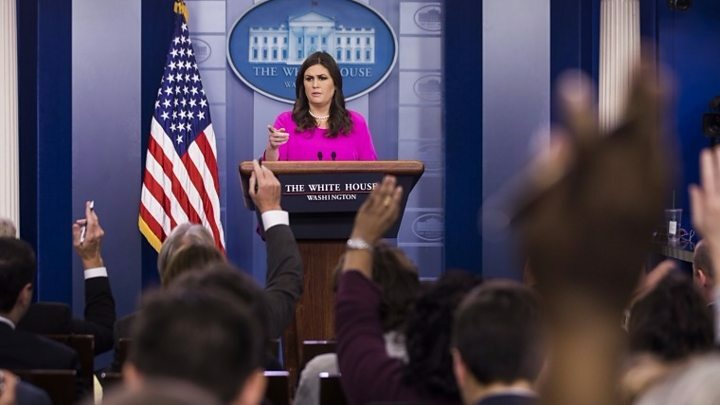 Media captionWhite House: "Today's announcement has nothing to do with the president"
He had been in a "volunteer position", she said, and "no activity was done in an official capacity". She also stressed that none of the charges against Mr Manafort related to the Trump campaign. When it came to allegations of Russian influence, she said, the focus should be on Hillary Clinton's campaign. "The real collusion scandal, as we've said several times before, has everything to do with the Clinton campaign, Fusion GPS, and Russia," she added. According to US media reports, Perkins Coie, a law firm representing the Clinton campaign and Democratic National Committee, hired intelligence firm Fusion GPS in April 2016. Fusion GPS, based in Washington DC, was paid to dig up dirt on Mr Trump, who was then Mrs Clinton's rival for the presidency.